I have to start by saying I'm very happy Danish Altar of Oblivion is back to releasing music after a four year pause which followed their Grand Gesture of Defiance. I may have been a little too unnecessarily on the critical side reviewing that album, but after a passage of time I have to admit Grand Gesture of Defiance has been a strong entry into the field of melodic epic power tinged doom. Such is the life of a serial reviewer that often we have to give opinions in a timely manner, in terms of the release date. This makes us speak somewhat in a premature fashion, before a dozen listens or so have time to sink in. 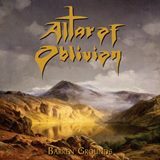 With that preface Altar of Oblivion certainly needs to offer the world their music more frequently, since, as you may have guessed it already, over the years I have become a fan. To put it simply, my melodic radar is very much tuned to the same frequency as Altar of Oblivion. I just love, for example, how they roll out and keep on building to epic heights in State of Decay. Serenity is a provocative intro to the title track, combining flutes, bass lines and female whispers. The title track itself then is a centerpiece of the EP, and also unfolds slowly, from bluesy to epic. While the whole EP doesn't lack in melodies and tunefulness, I still have problems with it the way I had them on my first spins through Grand Gesture of Defiance. The whole thing is just too quiet and needs to be amped up, ramped up, and any other verb you can think of goes with “up” well. Altar of Oblivion music does not require unbelievable amount of grit to go with it, but there is no reckless abandon in their melancholy, no pain in the vocals, no emotion being worn on the sleeve. Reserved closer Lost does not help to invoke that emotion either. I know what needs to happen, I need to keep listening to Barren Grounds for at least as many times as I gave Grand Gesture of Defiance a chance, and things will click. Meanwhile, hopefully the Danes have a full album in the works.